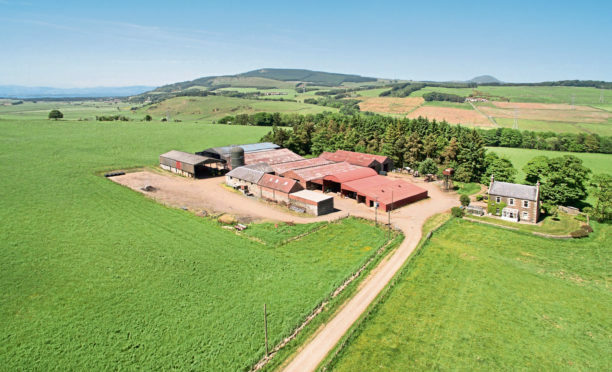 More than 500 acres of prime agricultural land in Fife has been put on the market at offers of over £2,620,000. The mixed farm of Auchmuir near Glenrothes, which is being sold by Galbraiths, includes a traditional three-bedroom farmhouse, a range of modern and traditional farm buildings and a derelict cottage that has the potential to be converted into a second dwelling. The land extends to 503.27 acres of which 249 acres are arable land, 231 acres are used as pasture and 18 are woodland. The James Hutton Institute (JHI) has classified the land as principally grade 3.1, grade 3.2 and grade 4.1 with some grade 5.1. It has been split into three blocks divided by a minor public road and there is access to the fields from a network of farm tracks or directly from the public roads. There are areas of woodland throughout the property. The farming system at Auchmuir is currently a mix of arable and livestock, with malting barley, spring oats and wheat as the main arable crops. The livestock business has consisted of 100 suckler cows with followers. “The farm benefits from being located in both a fertile and accessible area of rural Fife and I would expect Auchmuir to attract a considerable degree of interest. The farmhouse is attractive, spacious and retains many period features,” he said. The property is for sale as a whole or in three lots, at £1,530,000, £720,000 and £370,000.